Flavored syrup manufacturer Torani is excitedly watching the construction of its new headquarters at the Marina Gateway Center at 2000 Marina Boulevard, whose walls have now been tilted up. Once constructed, developer Overton Moore will have invested $45 million in the construction of a 330,000 sf facility for Torani’s 180 employees, who will manufacture, distribute, and showcase its internationally successful product. 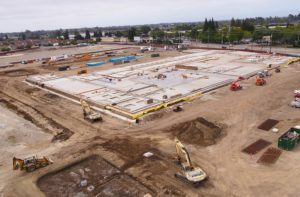 The new addition to the 306,000 sf Sears Outlet facility is taking shape, getting ready to welcome East Bay custom furniture manufacturer Friant at this facility, which is located at 1980 West Avenue 140th. As a part of a $18 million project, Friant will relocate its headquarters here, add a showroom and distribution hub, and bring over 150 jobs to the City. 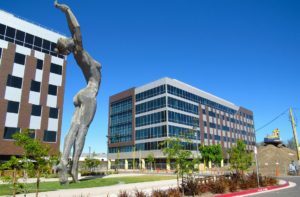 Westlake Urban broke ground last year on its second office building at the San Leandro Tech Campus, located at 1600 Alvarado Street, near the Downtown San Leandro BART station. The second building adds 132,000 sf of Class A office space to the Downtown area. You can enjoy the beautiful plaza, with the Truth is Beauty statue, and get a glimpse of construction up-close, at the monthly Truth Thursdays event. 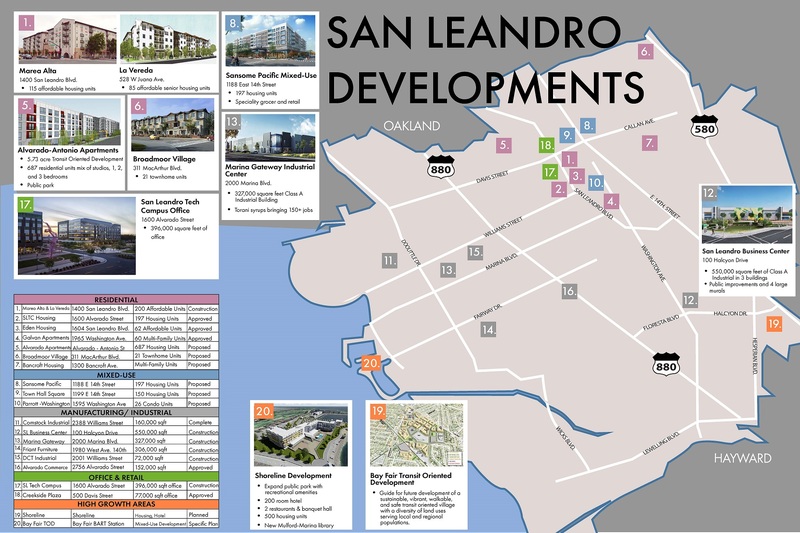 This event by the San Leandro Improvement Association, offers food trucks, music, and activities on the fourth Thursday of the month from 5:00to 9:00pm, with the next occurring on June 28th. DCT Industrial’s new building at 2001 Williams Street, across from 21st Amendment, is nearing completion. The developer is investing over $5 million in the building and hopes to lease this 75,000 sf building to a tenant in advanced manufacturing or food processing. 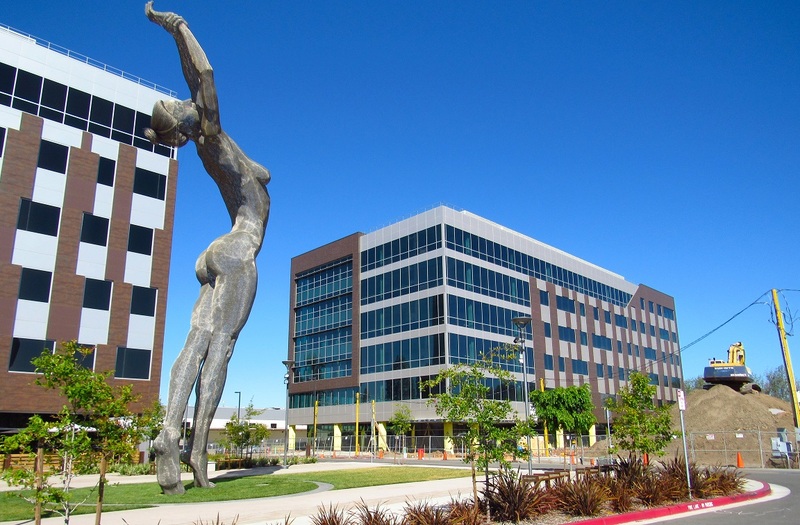 Next week, developer Trammell Crow aims to begin tilt-up of the first of the three buildings that will make up the San Leandro Business Center, which will add over 550,000 sf of Class A industrial space at 100 Halcyon Drive — the former home of the Kraft/Yuban plant that closed in 2016. The developer will invest nearly $80 million in this venture, with a potential for 500 jobs, and plans to enhance the buildings with large mural art and new landscaping. 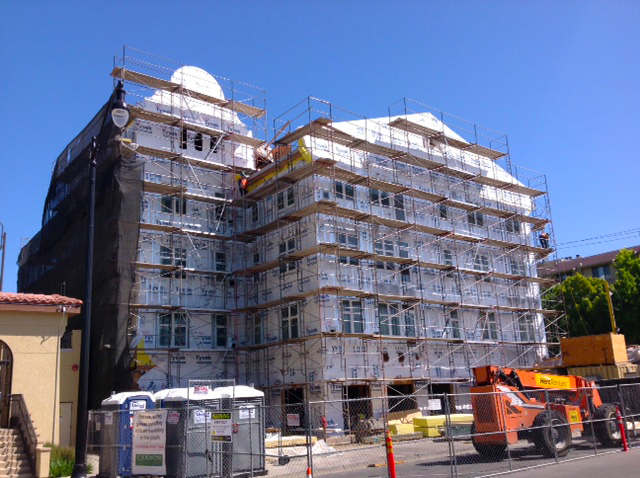 The modular construction of La Vereda, the sister facility of Marea Alta (the 115 units of affordable housing completed last year) is also moving along, and hoping for completion of the 85 senior apartment units late in the year. The application period for the senior apartments ended on March 23. Also the longtime vacant building at 325 Davis Street is finally being restored. I’m not sure what kind of project will be but there is a really neat mural in the parking lot! Can you please comment on the Sansome Pacific and Town square developments? Curious as to what has caused delays on these projects. It’s been almost 3 years for the Sansome development and no design has been approved yet based on the infograph. Hope things are going smoothly on this and the town square project. Sansome Pacific has been working on assembling the site, as there are many properties in that location. They are now under contract for the entire location and have submitted a planning application. They hope to begin construction in 2019. BEAM Development is still in its due diligence period for Town Hall Square, and is assembling the site. great thanks for taking the time to respond! Please improve the school system. As part of the Overall City Improvement plans, the persons responsible, for proposing and approving, ANY of these projects, should be requiring ALL incoming Businesses, to contribute to expanding, maintaining and constructing, infrastructure, to support traffic increase loads, repairing roads, and any Public review studies, for Fiscal and Enviromental Impacts, which always affect, every citizen of our City. Both ends of East 14th ( North ) and Mission ( South ) , are Eyesores , with Potholed and Perpetual Construction road work, welcoming visitors, to our city. You don’t see surrounding cities, letting their streets, STAY in a ENDLESS delapidated State of Dis-Repair. When Hayward, can make San Leandro look bad, comparing each city’s attention, to Blight and Urban Development, then San Leandro, has REALLY set the bar low. No more EXCUSES, ELECTED Officials! It’s time to do your jobs, and make moves and decisions, that require all Businesses, to contribute to all infrastructure Projects.